The site of the new Rentschler Field Football Stadium for the University of Connecticut was underlain by approximately 15 feet of dense sand overlying about 90 feet of soft to very soft clay. 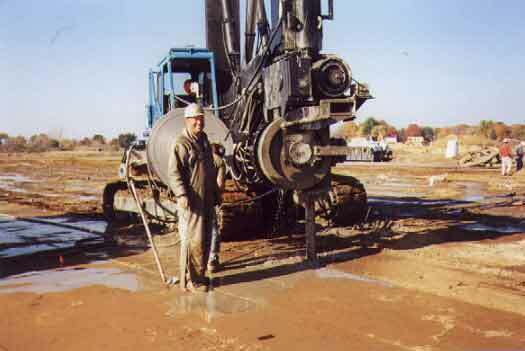 The groundwater table was located approximately 5 feet below the ground surface. Even a moderate amount of fill placement was anticipated to cause intolerable settlement. The geotechnical engineer, GZA, designed a wick drain program consisting of wick drains installed to a depth of 105 feet. The intent of the wick drains was to accelerate the consolidation of the soft clay prior to construction of the stadium. Approximately 8 feet of surcharge was placed over the wick drain area. The wick drains were installed in approximately three weeks. The average installation rate was over 20,000 linear feet of drain placed per day. The wick drains were installed with a specially-designed stitcher using a bottom gear drive. Due to the high fluid pressures existing at depths of over 100 feet, there was a strong tendency for the soft soils to “run” into the mandrel and prevent anchoring of the wick drain. To overcome this problem, it was necessary to keep the mandrel filled with water during the installation process, which effectively equalized the pressure within the mandrel with the soil pressure at the tip of the mandrel.